• Slight infringements will receive a penalty of shido. • Grave infringements will receive a penalty hansoku-make. If the referee decides to penalise the contestant(s), (except in the case of sonomama in ne-waza) he shall temporarily stop the contest by announcing mate, indicate the appropriate gesture for transgression and announce the penalty while pointing to the contestant(s) who committed the prohibited act. During the contest there will be two shido, and the third will be hansoku-make (2 warnings and then disqualification). Shido do not give a score to the other contestant, only technical scores can give points on the scoreboard. Shido will be given to the competitor deserving it, in place, without having both competitors return to the formal start position (mate – shido – hajime) except when a shido is given for leaving the contest area. There are several possibilities for disqualification (hansoku-make). When an athlete receives a hansoku-make they may or may not be allowed to continue in the competition if applicable. In the case of hansoku-make resulting from progressive penalties, the contestant penalised with three shido is allowed to continue in the competition. In the case of direct hansoku-make for protection of the judoka (diving head first onto the mat), the judoka is allowed to continue in the competition. A penalty or penalties will not decide the winner, except for hansoku-make (direct or accumulative). • Final – both athletes will be awarded 2nd place. • Bronze medal contest – both athletes will be awarded 5th place. • Semi-final – both athletes will be awarded 5th place. • Quarter-final or last 8 repechage – both athletes will be awarded 7th place. • Rounds prior to the quarter-final – both athletes considered to be losers and are out of the individual competition. They can compete in the team event if it follows an individual competition i.e. World Championships, Olympic Games etc. • Relevant ranking points will be assigned in the case of previous wins. In a round robin, if both athletes are given three shido, they are considered losers for that contest only and the contest result is recorded as 0-0. They can both compete in the next contest if applicable. In a team event, if both athletes are given three shido, they are considered losers for that match only and the contest result is recorded as 0-0. They can both compete in the next round if applicable. For a direct hansoku-make given to both contestants (in regular time or golden score), the IJF Jury will decide the consequences. A penalty can be awarded after the announcement of sore-made for any prohibited act done during the time allotted for the contest or, in some exceptional situations, for serious acts done after the signal to end the contest. Referees are authorized to award penalties according to the “intention” or situation and in the best interest of the sport. Should the referee decide to penalise the contestant(s), (except in the case of sonomama in ne-waza) he shall temporarily stop the contest by announcing mate, should penalise or return the contestants to their starting positions (Article 11) and announce the penalty while pointing to the contestant(s) who committed the prohibited act. Before awarding hansoku-make, the referee must consult with the judges and make his decision in accordance with the “majority of three” rule. Where both contestants infringe the rules at the same time, each should be awarded a penalty according to the seriousness of the infringement. Where both contestants have been given two (2) shido and subsequently each receives a further penalty, they should both be declared hansoku-make. A penalty in ne-waza should be applied in the same manner as in osaekomi. If a judoka (blue) commits a slight infringement and his opponent (white) throws him (blue) for waza-ari, both the penalty of shido for blue and the waza-ari for white will be given. If it is ippon (white) only the positive score will be assigned. If a judoka (blue) commits a slight infringement and throws his opponent (white) but the latter (white) takes advantage of the situation to continue in newaza, the referee must announce the penalty for blue and at the same time allow the action to continue in favour of white until it reaches a conclusion either or score or mate. If blue counterattacks (e.g. breaks the osaekomi and takes over the control, breaks the osaekomi by applying shime-waza or kansetzu-waza) the referee must announce mate. 1. Negative positions, against the fighting spirit, will be penalised by shido (to adopt in a standing position, after kumi-kata, an excessively defensive posture, not searching for an attack, a defensive attitude etc.). • Tori has no intention of throwing. • Tori attacks without kumi-kata or immediately releases the kumi-kata. • Tori makes a single fake attack or a number of repeated fake attacks with no breaking of uke’s balance. • Tori puts a leg in between uke’s legs to block the possibility of an attack. 3. To pull the opponent down in order to start ne-waza unless in accordance with Article 10. Where one contestant pulls his opponent down into ne-waza not in accordance with Article 10 and his opponent does not take advantage of this to continue into ne-waza, the referee shall announce mate and give shido to the contestant who has infringed Article 10 (without returning to the starting position). 5. To put a hand, arm, foot or leg directly on the opponent’s face. The face means the area within the line bordered by the forehead, the front of the ears and the jawline. 6. To go outside the contest area or intentionally force the opponent to go outside the contest area either in standing position or in ne-waza. (See Article 5 - Exceptions). If a contestant puts one foot outside of the contest area without immediate attack or not returning immediately inside the contest area is penalised by shido. Two feet outside the contest area is penalised by shido. If the contestant is pushed outside the contest area by his opponent, then the opponent will receive a shido. (If the competitors leave the contest area, they are not penalised by shido when the attack is engaged in a valid position). 7. To force the opponent with either one or both arms to take a bending position without immediate attack will be penalised by shido for a blocking attitude. 8. To intentionally avoid taking kumi-kata in order to prevent action in the contest. Normal kumi-kata is taking hold the right side of the opponent’s judogi, be it the sleeve, collar, chest area, top of the shoulder or back with the left hand and with the right hand the left side of the opponent’s judogi be it the sleeve, collar, chest area, top of the shoulder or back and always above the belt or vice versa. As long as a contestant makes a cross grip, that means with two hands, one hand on the opposite side of the back, shoulder or arm of the other contestant, he should attack immediately, or the referee must penalise with shido. Under no circumstances it is permitted to grab below the belt. Cross gripping should be followed by an immediate attack. Same rule as for belt gripping and one side gripping. A contestant must not be penalised for holding with an abnormal grip if the situation has been brought about by his opponent ducking his head beneath the holder’s arm. Instead, the judoka who ducking beneath the holder’s arm without an immediate attack will be penalised with shido (2). Hooking one leg between the opponent’s legs unless simultaneously attempting a throwing technique is not considered to be the normal kumi-kata and the contestant must attack immediately or the referee must penalise with shido. 9. Unconventional kumi-kata (cross grip, one side grip, belt grip, pocket grip, pistol grip etc.) 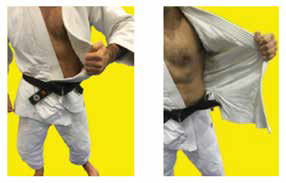 will be penalised if there is no immediate attack (see the following examples of unconventional kumi-kata). 10. In a standing position, to continually hold the opponent’s sleeve end(s) for a defensive purpose or to grasp by “screwing up” the sleeve end(s). 11. In a standing position, to continually keep the opponent’s fingers of one or both hands interlocked, in order to prevent action in the contest or to take the wrist or the hands of the opponent only to avoid the grip or the attack on him. 12. To insert a finger or fingers inside the opponent’s sleeve or of his trousers either in the ends of the trouser legs or in the waistband. 13. To bend back the opponent’s finger(s) in order to break his grip. 14. Breaking the grip of the opponent with two hands (the referee should give shido only in the case of done infringement, not for supposed infringement). 15. Breaking the grip of the opponent with the knee or leg. 17. Avoid uke’s grip with a blow on his arm or hand. 18. Blocking the opponent’s hand. 19. To intentionally disarrange his own judogi; to untie or retie the belt or the trousers without the referee’s permission; to intentionally lose time arranging his judogi and belt. 20. Leg grabbing, grabbing the trousers, blocking or pushing the opponent’s leg(s) with their hands or arms. It is possible to grip the leg only when the two opponents are in a clear ne-waza position and the tachi-waza action has stopped. These are valid actions and no shido will be given. It is possible to grip the leg only when the two contestants are clearly in ne-waza and the tachi-waza action has stopped. Tori in this tachi-waza position can apply kansetsu-waza or shime-waza because uke is in a ne-waza position. 21. To encircle the end of the belt or jacket around any part of the opponent’s body. The act of “encircling” means that the belt or jacket must completely encircle. Using the belt or jacket as an anchor for a grip (without encircling), e.g. to trap the opponent’s arm, should not be penalised. 22. To take the judogi in the mouth (either his own or his opponent’s judogi). 23. To put a foot or a leg in the opponent’s belt, collar or lapel. 25. In shime-waza or kansetsu-waza while over-stretching the leg is forbidden: the referee will announce mate immediately and sanction the contestant with shido. Shime-waza is not allowed with either your own or your opponent’s belt or bottom of the jacket, or using only the fingers. shime-waza while over-stretching a straight leg is forbidden. Special attention will be given to situations: where tori, whilst applying a shime-waza, also over-stretches and straightens uke’s leg. Mate must be called immediately and a shido given. 26. To hug directly the opponent for a throw (bear hug). Precision: To attack with a bear hug the athlete must have a minimum of one grip. It is not valid to make a second grip simultaneously. Only touching the judogi or the opponent's hands in order to avoid grips, is not considered as kumi-kata, gripping is necessary. Bear hug - double points: if, after a blue bear hug, white throws blue for a wazaari, the score (white waza-ari) and the penalty (blue shido) will be given. These are valid grips for bear hug. 27. To apply leg scissors to the opponent’s trunk (dojime), neck or head (scissor with crossed feet, while stretching out the legs. In shime-waza (e.g. 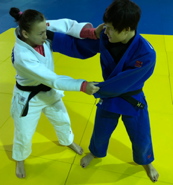 ryote -jime) it is forbidden to use the legs to assist the grip. 29. If both of the athletes are in a tachi-waza (standing position) and one or both apply kansetsu-waza or shime-waza. Mate and shido should be announced. However, if the action is dangerous or can injure the opponent, it will be hansokumake. 30. The act of entangling the leg without making an immediate attack must be penalised with shido. Hansoku-make is given to any contestant who commits a grave infringement or who having been given two (2) shido, commits a further slight infringement. Direct hansoku-make for protection of the judoka: the competitor loses this contest but can continue in the competition if applicable. 1.To “dive” head first, onto the tatami by bending forward and downward while performing or attempting to perform techniques such as uchi-mata, harai-goshi, etc. or to fall directly backwards while performing or attempting a technique. 2. Head defence, to ensure that judo has as little trauma as possible, if uke attempts voluntarily to use the head with any movement which is dangerous for the head, neck or spine, for defence and to avoid landing in / escaping from a score he shall be penalised with hansoku-make. Special attention will be given to situations where tori attempts to throw his opponent during tachi-waza with, for example, seoi-otoshi (drop seoi-nage), sodetsurikomi-goshi with the grip on both sleeves and koshi-guruma with both grips on the collar and uke makes an involuntary head defence. These are examples and this situation can occur with other throwing techniques. In this situation there is no penalty for either tori or uke. Direct hansoku-make for acts against the spirit of judo: NOT allowed to continue to the next contest, out of competition. 1. To apply kawazu-gake (to throw the opponent by winding one leg around the opponent’s leg, while facing more or less in the same direction as the opponent and falling backwards into him). Even if the thrower twists/turns during the throwing action, this should still be considered “kawazu-gake” and be penalised. Techniques such as o-soto-gari, o-uchi-gari, and uchi-mata where the foot/leg is entwined with opponent’s leg will be permitted and should be scored. 2. To apply kansetsu-waza anywhere other than to the elbow joint. To attempt such throws as harai-goshi, uchi-mata, etc., with only one hand gripping the opponent’s lapel from a position resembling ude-hishigi-waki-gatame (in which the wrist of the opponent is trapped beneath the thrower’s armpit) and deliberately falling, face down, onto the tatami is likely to cause injury and will be penalised. No intent to throw an opponent cleanly onto his back is a dangerous action and will be treated in the same way as ude-hishigi-waki-gatame. 3. To fall directly to the tatami while applying or attempting to apply techniques such as ude-hishigi-waki-gatame (see point 2 above). 4. To reap the opponents supporting leg from the inside when the opponent is applying a technique such as harai-goshi etc. 5. To make any action this may endanger or injure the opponent especially the opponent’s neck or spinal vertebrae or may be against the spirit of judo. 6. To intentionally fall backwards when the other contestant is clinging to his back and when either contestant has control of the other’s movement. 7. To lift off the tatami the opponent who is lying on the tatami and to drive him back into the tatami. 8. To disregard the referee’s instructions. 9. To make unnecessary calls, remarks or gestures derogatory to the opponent or referee during the contest. 10. To wear a hard or metallic object (covered or not). 11. Any action against the spirit of judo (this includes anything that can be described as anti-judo) may be punished by a direct hansoku-make at any time in the contest. When a contestant has repeated slight infringements and is to be penalised with his third (3rd) shido the referee, after consultation with the other referees, shall give the contestant hansoku-make, that is to say that the third (3rd) shido is not announced as shido, but shall be announced directly as hansoku-make. The contest ends according to the Article 13. - Negative positions will be penalized by Shido, because they are against the spirit of judo (not searching for an attack, a defensive attitude etc.…). - Leg grabbing or grabbing the trousers, shall be penalized by Shido. Safety:  Summary: Bridging to avoid a back landing will be awarded Ippon to tori. Voluntary use of the head for defense to avoid landing in/escaping from a score will be a direct Hansoku Make. The competitor will only lose the match (similar to head diving). Landing on both elbows or two arms or one elbow and one hand will be awarded a Waza-ari. Landing on one elbow will not be scored. Any action to avoid competing or purposefully attempting to avoid competing to utilize time on the clock will be considered acting against the spirit of judo and will be penalized with Hansoku Make. • The committee examined the rules with regard to safety to ensure that judo has as little trauma as possible. • If Uke attempts to avoid landing on their back by any movement which is dangerous for the head, neck or spine, they shall be penalized with Hansokumake. •The competitor loses this contest, but may continue in the competition if the situation in the tournament system allows it. • In order not to give a bad example for young judokas, the landing on both elbows, both hands or one elbow and one hand is considered valid and evaluated as Waza-ari. • Landing on only one elbow is invalid and can not be used for assessment. Uke's elbow must be posted and torso must not touch tatami. • Anti judo will be immediately penalized as an act against the spirit of Judo. No change. If an athlete is running to avoid competing in a judo contest or to escape from the opponent, that competitor will be considered as acting against the spirit of judo and will be penalized with Hansoku Make.